"The Best way to discover Versailles from Paris !" 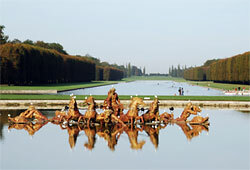 The Fountains at the palace of Versailles were inaugurated in 1666 by Louis XIV. At that time water supply was a technical challenge to match the Sun King’s ambition. It required colossal construction work. The Musical Fountains is an enchanting moment with the fountains running in full-play with a musical background that visitors discover wandering in the gardens. There are two walking tours or sound areas matched with pieces mostly from Lully but also from Desmarets, Gluck and Rameau. The Musical Fountains generally takes place on week-ends, and some Tuesdays, from end of March to end of October and at Night Fountains are generally organized on Saturdays from mid June to mid September. The Apollo fountain depicts Apollo conqueror on his chariot pulled by four horses representing force and ardour, getting out of the water among sea monsters to enlighten the Earth as he represents the rising Sun. 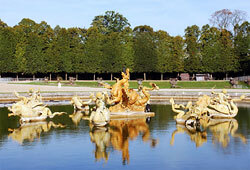 In Versailles all the statues of Apollo, the sun god, represent Louis XIV, the sun king. The grand final of the Fountains Show takes place at the Neptune fountain. The construction of this fountain lasted more than a century. The twenty two jets in the middle of the fountain, the twenty two jets from the vases adorned with marine animals plus the presentation jets allow a combination of about a hundred special effects. 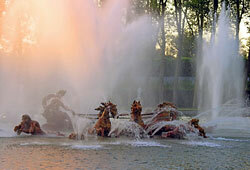 The fountain represents Neptune, the god of seas and oceans, his wife, dragons, and Cupids.